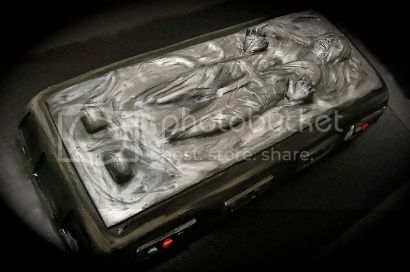 Debbie Goard of Debbie Does Cakes (last seen in the vicinity of the Left 4 Dead cake) crafted this Han Solo in carbonite cake. For, like… a birthday or something. Definitely a party of some sort. Yeah. * Aaaaaand… there it is. I’ve finally become so jaded by photos of spectacular geeky cakes that anything less than ming-boggling perfection turns me into an ingrate. Well, it’s your own damn fault for setting the bar so high, internets.